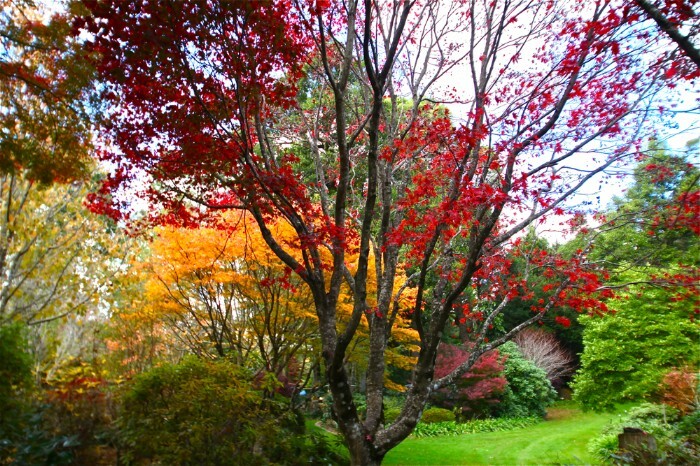 Mt Wilson, in the northern Blue Mountains, sits firmly in the world of grand estates and manicured gardens. Symphonies are held in the gracious gardens while displays of autumn leaves hover somewhere between refined and psychedelic. Red maples play with yellowing ones against a background of deep evergreen exotics in a show the equal of a Monet garden. As with most pictures of serene natural beauty it is a function of catastrophic geological events. Volcanic intrusions capped most of the Blue Mountains with basalt millions of years ago. It lingered almost as long as John Howard until finally eroding away. As Howard left Tony Abbott to remind us of the past, so too a small pocket of basalt remains on top of Mt Wilson. Unlike Abbott or Howard, the soils are rich and nutritious and support a diversity of magnificent foliage, all species blending together in a harmonious mix of Asian rhododendrums, Japanese maples and American liquid ambers. When Dutch elm disease wiped out the European elm, seeds immigrated to Australia and thrived, not the least here in this perfect mountain climate. The botanical diaspora is surrounded by the wildest Australian bush imaginable. The Wollemi National Park circles Mt Wilson and here the Wollemi pine was found. 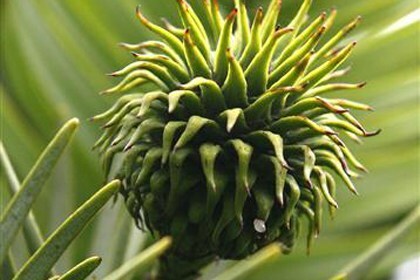 There was as much chance of finding a dinosaur as this prehistoric plant. David Noble, who discovered Wollemi Nobilis, is one of a group of powerful walkers who disappear into the vast wilderness.They are anthropologists, archeologists, didgeridoo players, old hippies and wild men who explore the dissected plateaus looking for aboriginal rock carvings and engravings. 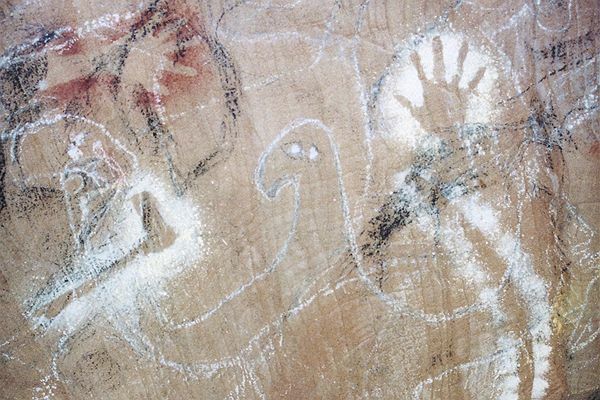 The Wollemi Rock Art Project has logged hundreds of aboriginal occupation sites. The most startling being a platform called Gallery Rock. On an enormous slab of sandstone,100 metres long and 50 metres wide, like an Aztec platform or an antipodean Mt Olympus, it is covered with carvings and drawings. All of the most powerful ancestral beings are here: the supreme spirit Baiame; his son Daramulan; another 42 figurative motifs; ancestral emu women and men as well as an evil child-eating spirit with a club foot; a spectrum of the most powerful spirits of the Aboriginal universe and all assembled in this pantheon of Gods. Like a gated community, Mt Wilson stands apart from this world. Its genteel sculptures, dazzling azaleas and understated St George's Church are testament to another sensibility. The Dreaming is for Mother England rather than mystical beings. The children of Marcus Clark, who started a department store chain, built the Anglican church. Patrick White's parents lived here and he wrote of it in Flaws in the Glass. Withycombe, one of the largest estates in The Avenue was constructed by a grandson of William Cox, who built the first road over the Blue Mountains. The Mt Wilson mansions are those of the founding white settlers. I want to run a 3 or 4 day program in this beautiful place. There are good arguments for art and photography workshops. Perhaps a writer's retreat in the Jane Austen tradition. I'll play Heathcliffe. We can bunker down in some beautiful B&B and walk from the township into the surrounding wilderness like kids visiting the other side of the tracks. Then back to the warmth and sanctuary of the fire. Maybe in springtime when romance is in the air and the flowers are blooming. Not just for us but for the bronzewings, red-whiskered bulbuls, butcher birds, yellow tailed cockatoos and gang gangs that come to feed..
As basalt, John Howard and Tony Abbott are remnants of another age, so too is Mt Wilson. It is more than that though. It is a temple to pure aesthetics. Bruce Chatwin thought that the future of humankind resided in an appreciation of beauty. I won't hold my breath for that to happen. But as Tommie [Dog Blog-13] and I walked Mt Wilson last Saturday, on a perfect autumn day, I see his point. Hi ES Interesting take on John and Tony! Thanks for the wonderful 'guided tour' of Mt. Wilson; you make it come alive for the reader. I thought the photo of the grass was Tommie's hair standing on end at first. It's almost like an abstract painting too. What a great little mate Tommie is, eh! Your amazing adventure begins. The 3 or 4 days with Heathcliffe sounds enchanting, but careful you don't bite off more than you can chew ES, with the multitude of lady followers you are accumulating, all after your Noskapar secrets.Where did you come across Bruce Chatwin's ideas? You've got a good memory after all that time Heathcliffe!I used to own a copy, but someone forgot to return it. Maybe I should try to find a copy at the library and read it again. What beautiful images and words. There are so many stunning places in the world - just returned from Sedona (Arizona) and Mt Shasta (northern California). We need to appreciate and connect with them more. Hey Heathcliffe! That is so funny because I am re-reading Jane Austen at the moment. I love the mountains and nearly bought a charming cottage at Puluma just north of Townsville. The early settlers called it Misty Mountain and I believe the aboriginies named it Gumbaru. I love it there but the cottage was sold by the time I was ready to make an offer. Anywho, your Mt. Wilson does sound enchanting and a stay there in the clear mountain air would be lovely. First I'd better get a job and save some money, though. Hey Rosa. I want to run smaller, shorter trips that are less expensive. Just talked to the writer Linda Jaivan. She is interested to run a workshop in Mt Wilson. Stay tuned. Hey Anne. Nor can I. What a buzz. I wont be leaving for a week or so. Not sure whether to turn left or right at the end of my street. Have a safe journey, Raymond! Will you be meeting us choir people in the Alice? Thanks Cecilia. Yes. I will be doing the desert trips and developing another range of shorter programs. In between I will be writing and exploring. I wont be leaving for a week or so. Just tidying up everything at the moment. Raymond you know that Emily Bronte wrote Wuthering Heights featuring a character Heathcliffe who had no sense of humour - wild and mad yes - is that you? Mount Wilson, beautiful photos but a bit posh these days, don't you think? How about Mount Irvine? By the way, are you planning a book launch? Am I planning a Book Launch. Was the pope a member of the Hitler Youth. I think it will be in September. Re Heathliffe - two out of three aren't bad. Mt Wilson has always been posh. Grand houses and massive gardens for the gentry of early Sydney.